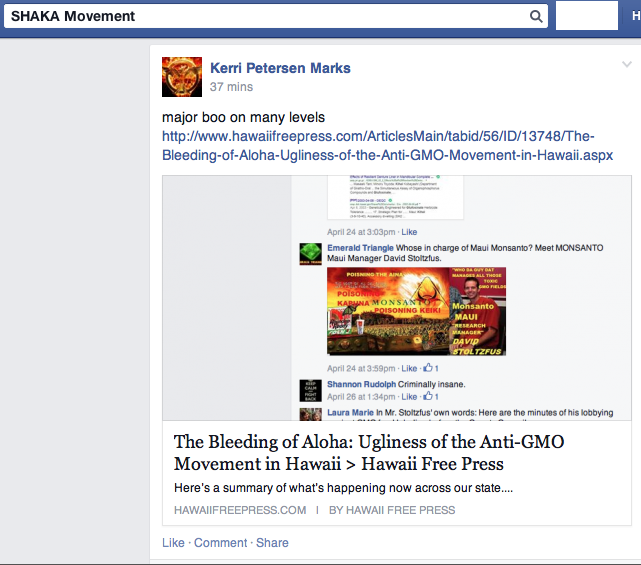 I find it hard to believe that little Hawaii has become the center of the worldwide GMO controversy. The global political war is taking place right here in our communities and can literally destroy it with bad policy. I refuse to sit back and let that happen without a fight against misinformation and fear. Hawaii was built upon agriculture and we are on a dangerous path to tearing apart the very fabric that brought so many of us together. The stories of the people in agriculture need to be heard and here’s one of them by April Piilani Augustiro. Moloka’i is a special place. Many of us on either side will agree to that!! Our population is about 7,000 and basically, we all know each other. We’re somewhat related in sooo many ways. We call eachother aunty, uncle, cousin, even our friends’ grandparents become ours as well, and most times if you’ll know someone here related to someone. That’s good for many of us as it’s pretty easy to become family. However, we are considered very territorial people as well, we don’t like being pushed around on our own aina and we sure don’t like people coming here and taking over the little we have adapted to. 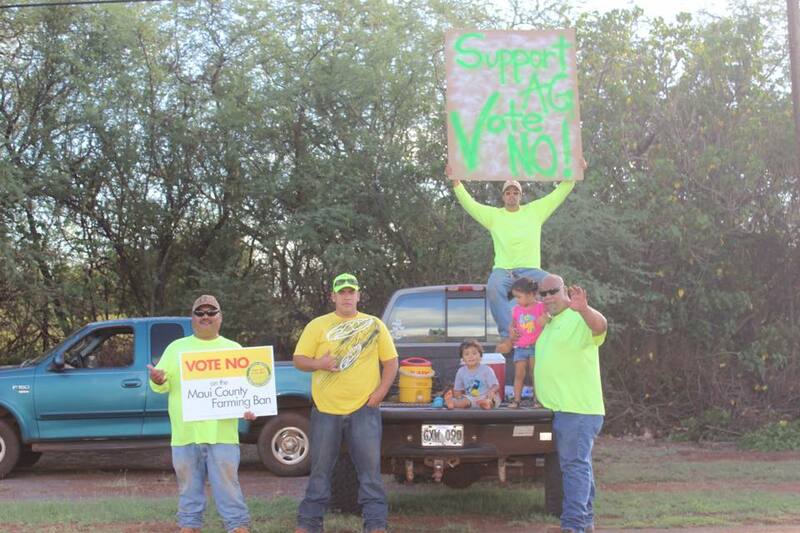 Many of us that work for these seed companies, are sons and daughters, fathers and mothers, brothers and sisters, grandparents, Tball coaches, football coaches, affiliated in many community organizations, and we too, like many on the other side claim, LOVE OUR AINA and CARE ABOUT our people!! We are normally the quiet majority, many of us wake early in the morning to begin our day by 6:30 a.m., and often times, work longer than an 8 hour shift. We are FARMERS! Whether we work indoors or outdoors, because TOGETHER, we are the ones that “nourish” the product of our fields!! I stand amongst some of the most respectful, dedicated, and compassionate people on our island. Many of them have toiled the fields for years and years, many are some of the most hard working I know. This initiative is hard to swallow. 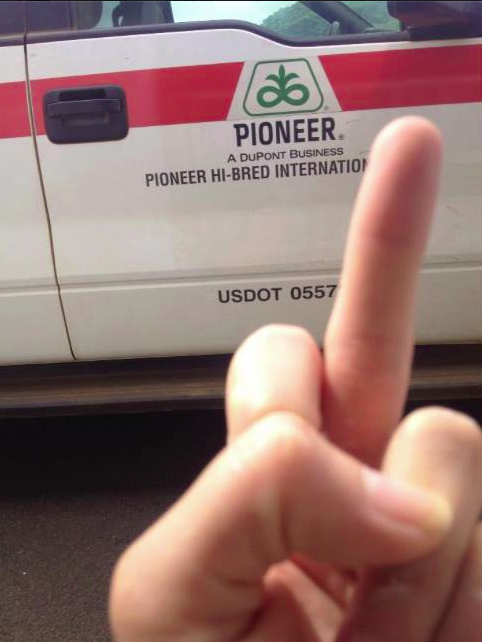 It’s hurtful to the many of us that work for these seed companies. It will be devastating in every which way, and will definitely hurt our economy greatly!! How can we allow others that don’t believe in what we do, take that away from us? How can we sit back and let their opinions disrupt our livelihood? Let’s talk about FACTS!! I say, you want a study done? Go fund it, go do it, but don’t STOP us from doing what we’re doing!!! It’s time for us to TAKE OUR “SHAKA” BACK!!! We’re gathering together, one by one to do just that! Was one awesome feeling! The feeling was not that we had many, but the feeling that this is PONO! That what we do is SAFE! After that was a feeling of hope, that people are being educated, and learning and understand the effects of losing jobs and the ripple effects that would happen. One thing about this island! Where the majority stands, in rumor or action, it is usually true and what we should be fighting for. Sadly, not all ended up in victory but we KNOW TRUTH! We are not hiding anything… We KNOW where this road leads, and it’s not to a happy ending if we lose this fight. VOTE NO! Standing out there was a very humbling experience for me. Seeing a lot of people standing up for what they believe in was awesome! To see the faces of those this initiative will affect, brought tears to my eyes. I was grateful to have had the opportunity to be a part of this. It was truly uplifting to see the unity in what was once thought to be a minority!! We are not going down so easily… fighting til the end!! 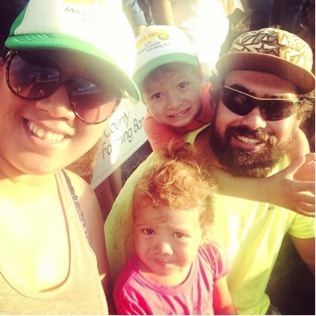 As a family, we initially decided to be present at the sign-waving as our own unit, our own family front, our own public display of support for ALL farming and for the opportunities that my husband’s occupation has given us. But the reality was awe-inspiring. To see so many community members and fellow employees, our family unit grew to include hundreds of others. ALL these people support our same view. ALL these families have a point to make. ALL these community members have a voice and they want to use it! Looking at our children, and the countless others there, you have to wonder how this will affect them if this moratorium goes through. We left great paying jobs in the mainland, took smaller incomes and increased cost of living because it takes a village to raise a child and the village we chose is Molokai. That village was there yesterday, asking how our other family members were doing, talking story, laughing, supporting eachother, together. These are the faces we see every day, faces we know one way or another. 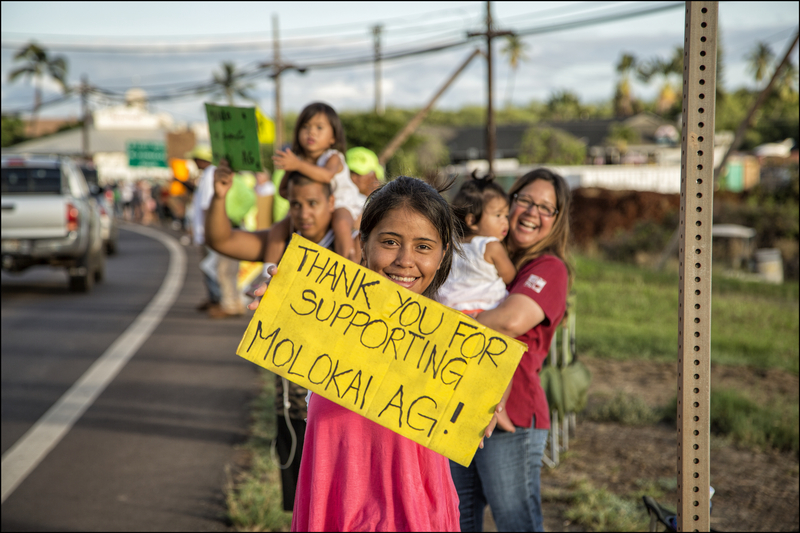 These are the faces of Molokai, the village we will always choose. 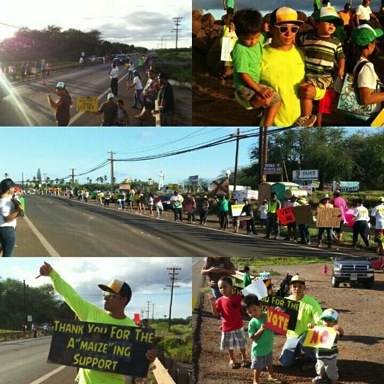 It was such an amazing and hubmling experience seeing hundreds of our own Molokai people come out to support eachother. With all the craziness and division this issue has brought to our community, it was a nice break and so uplifting. Good vibes, clean and respectful signs, many of them reading “thank you for your support”, extended families, new and old friends, smiling, laughing…. Such a good reminder of why we’re all in this. It was definitely one of those moments where you just know that you’re doing the right thing. 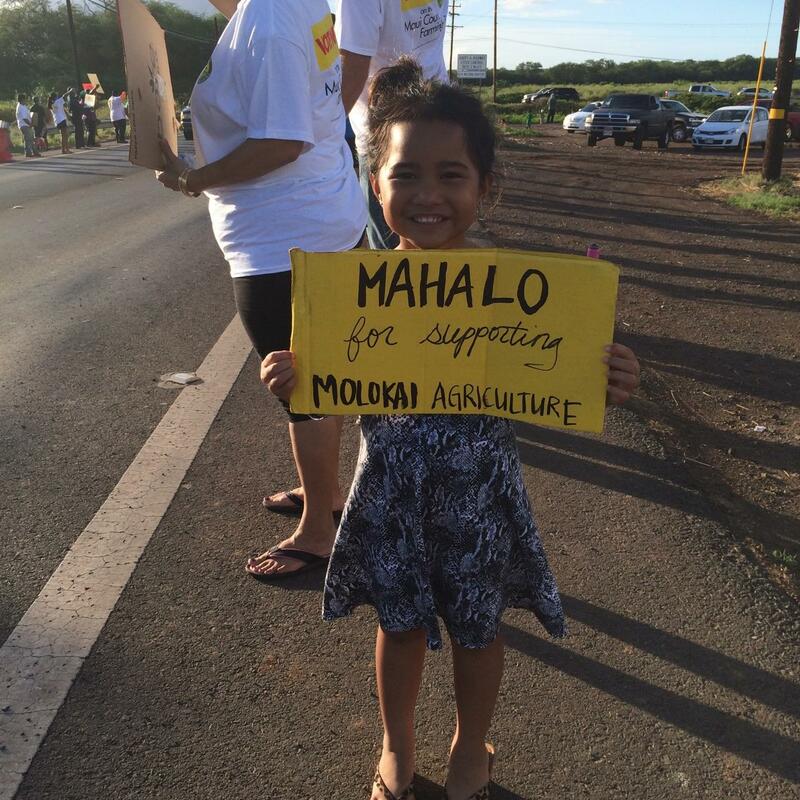 The story of agriculture comes from the people who work the lands and grow Hawaii. 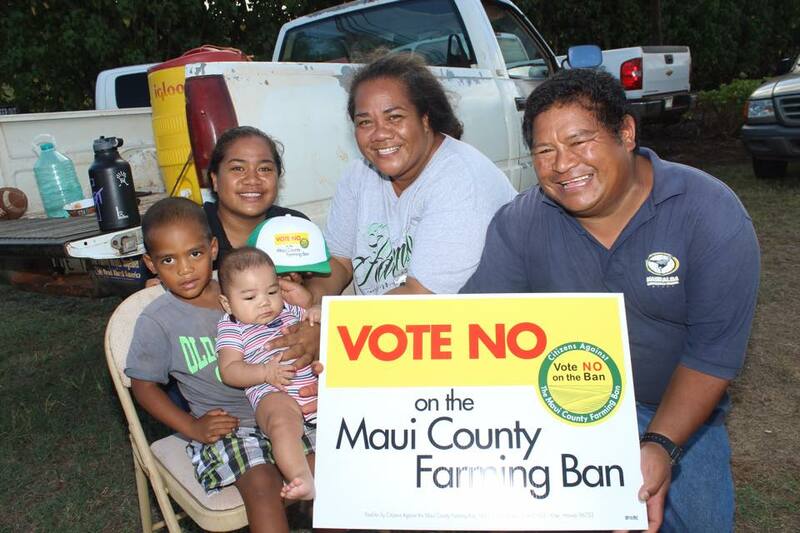 These are the faces of Hawaii agriculture! It is our heritage and a part of each and everyone of us! 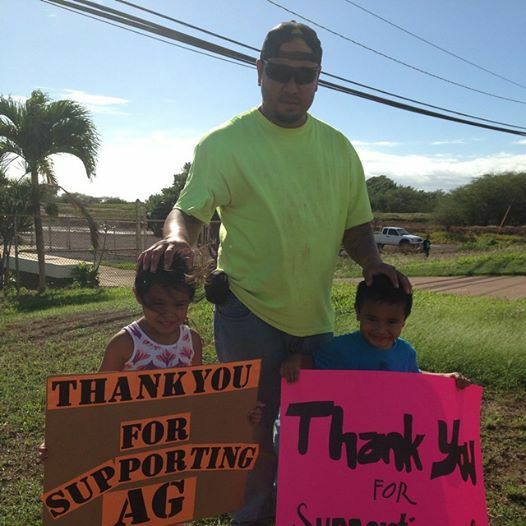 We are proud to be Hawaii ag! 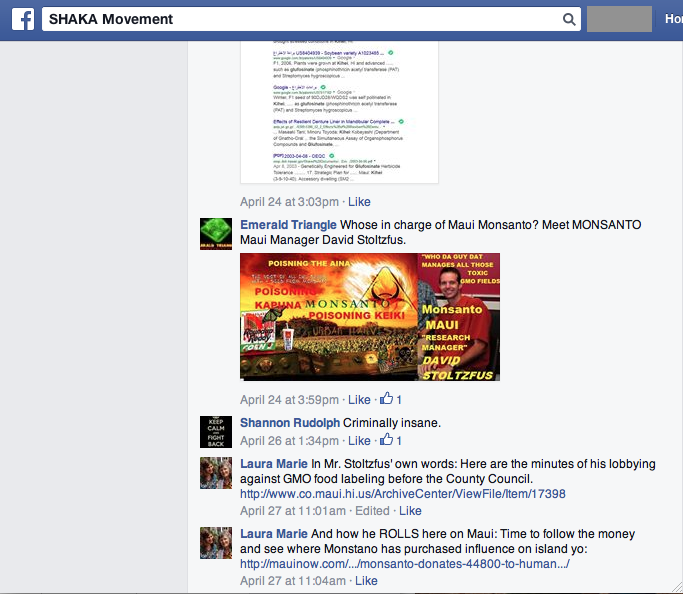 Slander, Lies, Rants: Are you Proud to Be A SHAKA Anti-GMO Activist? Let’s get one thing really clear here before you continue reading this post. Many of the anti-GMO activists haven’t quite figured out or thoroughly read my blog to learn that I’m not paid to write it. If I did, I still have yet to discover where my checks from Monsanto and Dow are going to. They apparently must know because they keep thinking I’m paid to write this blog, but sorry to burst your shill bubble, you’re dead wrong. If you have a bit more logic, you might ask, then why do I write it? Honestly, I’m sick and tired of the misinformation and outright lies that are being said about biotech farmers, scientists, researchers, and other agriculture supporters. I also don’t care for the ugliness that is being perpetuated across our islands in the social media and the environment. 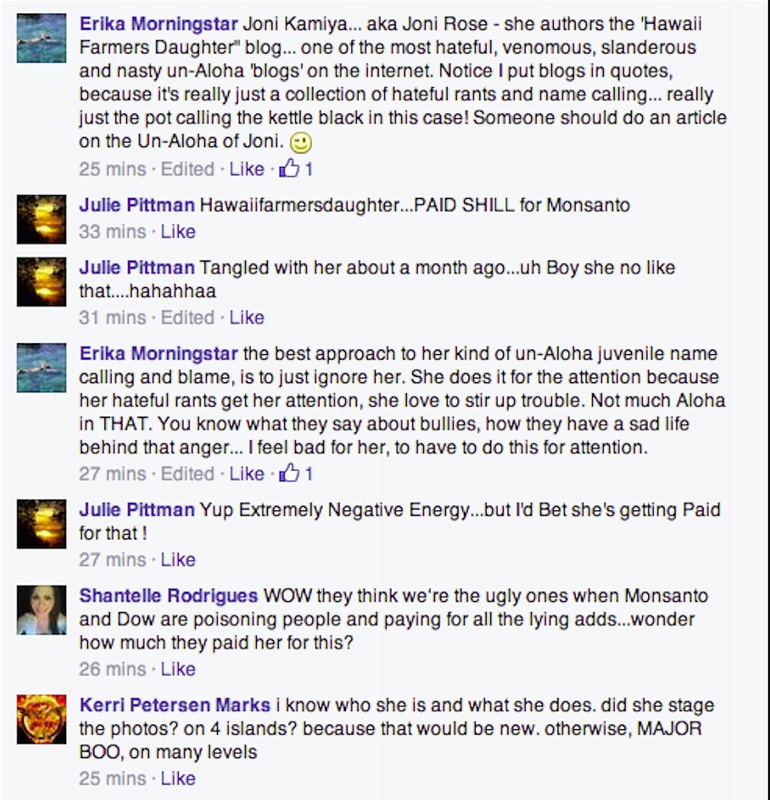 Posting these uglies are a good reminder of who these anti-GMO activists really are and holds THEM accountable for THEIR actions of no aloha. 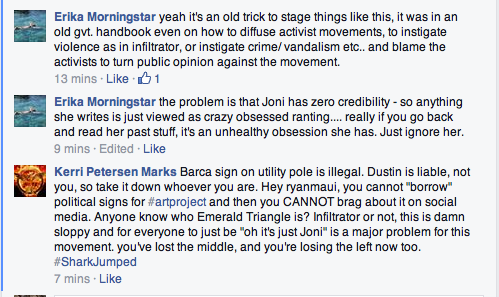 If the activists didn’t resort to this kind of stuff, I’d have nothing to write and it would be wonderful. That would be the day because these people apparently don’t give a rip about what they do or say so it gives me plenty to write about. I find it funny that they call this blog hateful. It’s their own postings that make it hateful! I can’t make up the comments they write nor do I have photoshopping skills to manipulate things. So where’d the hate come from? These people themselves are the sources of it! There is hope that some of these people do recognize that these actions aren’t right and aren’t helping the cause. 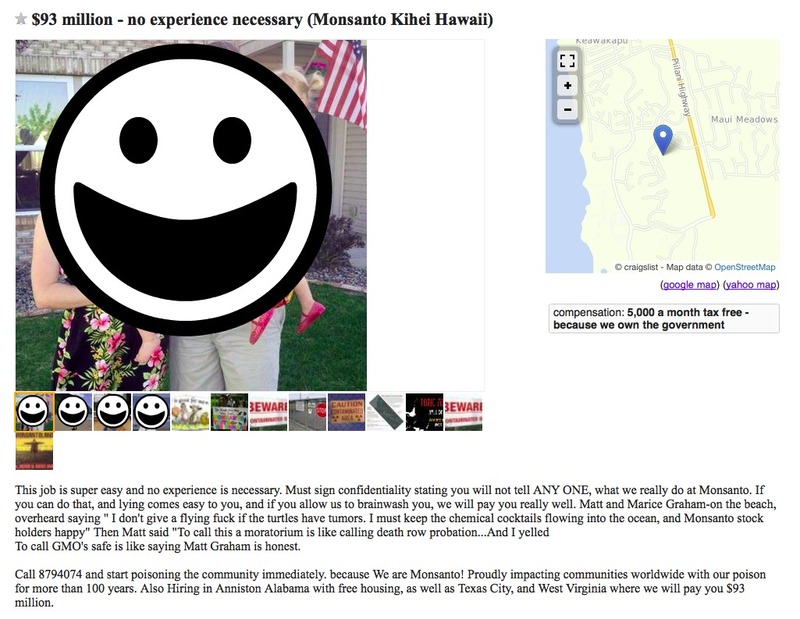 Yes, activists, please stop giving others reasons to expose your ugliness and bleeding Hawaii of your new kind of aloha. It can no longer be ignored by others already. You can blame me for “staging” this stuff or being “slanderous” or whatever accusation you can think of, but the fact of the matter is that it came from what you have promulgated in our communities. Isn’t slander when you say stuff to harm a person’s reputation? Is it still slander when the source if yourself?! Ask yourself, do you want to be associated with all of this un-aloha? While you drive along the coast of Maui near Olowalu, this is a beautiful site you get to see! 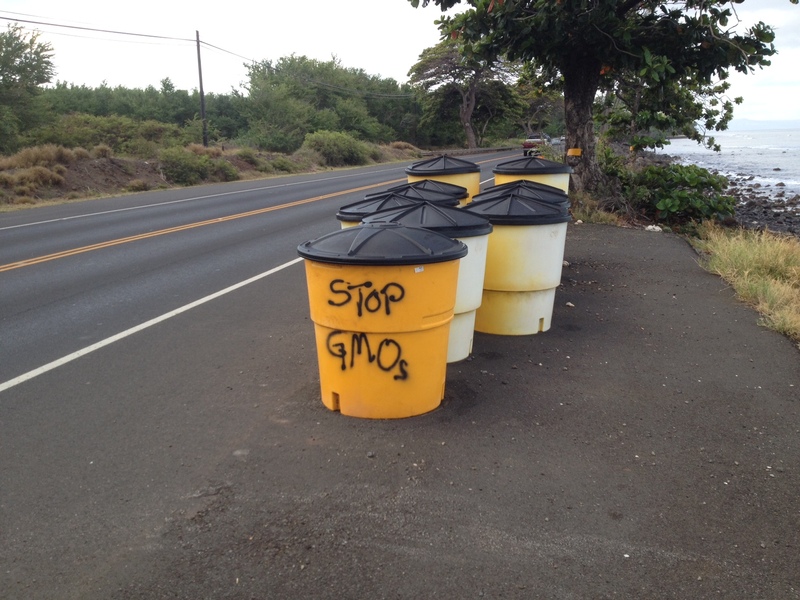 “Stop GMO” scrawled on a barrel to remind you of Maui’s hospitality. 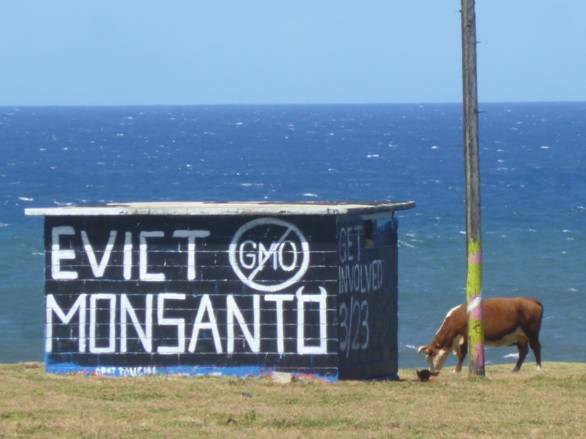 More coastal property vandalism on Maui. 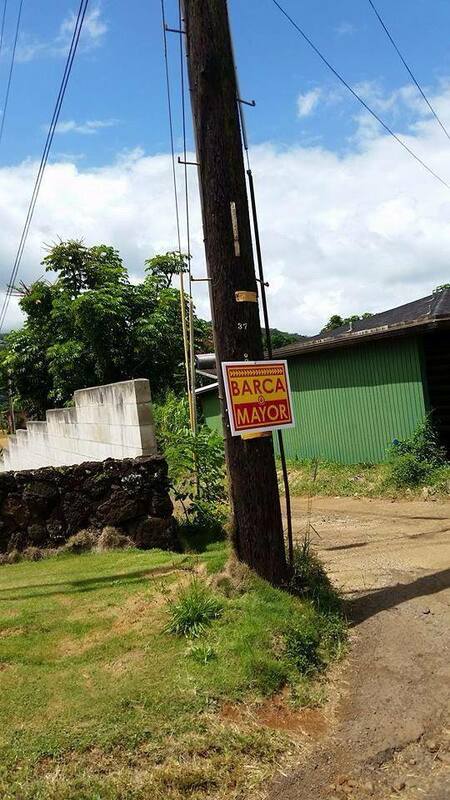 Vandalism on signs going up to Pukalani. Parents bringing their kids to their protests with scary images scrawled on GMO cotton sheets with chemicals. Defacing of stop signs on private property. 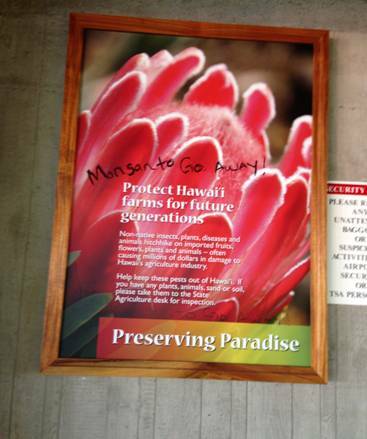 Tourists get to be greeted by “Monsanto go away” messages at Kahalui airport! 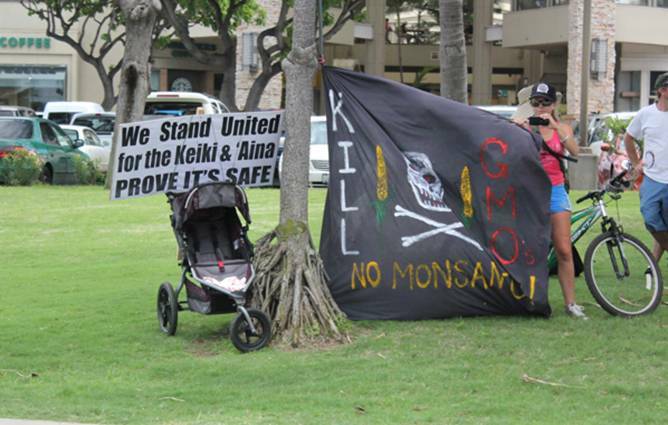 A company banner stolen and defaced with the anti-GMO aloha. 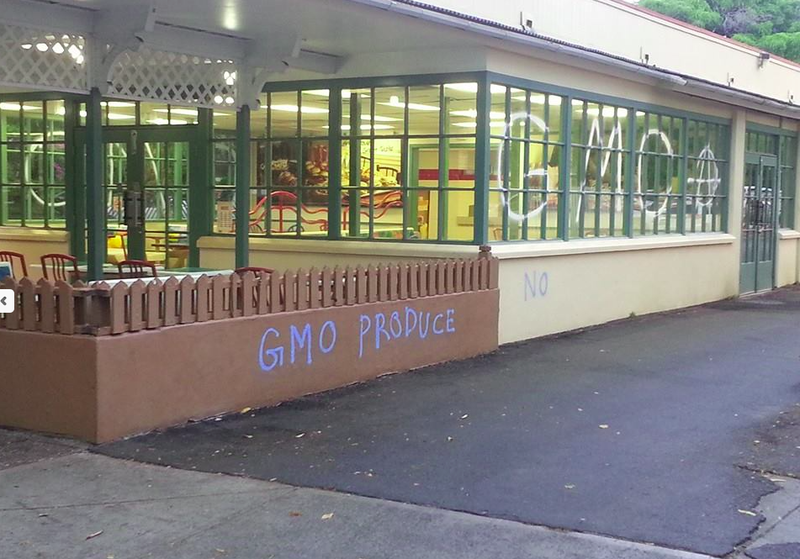 Public property is a free for all when you’re an anti-GMO activist! Get your chemical laden spray paint and all of it’s drift and spray away! I can’t forget to mention another collaborator with the SHAKA Movement either! How could I not include the aloha of the Babes Against Biotech?! 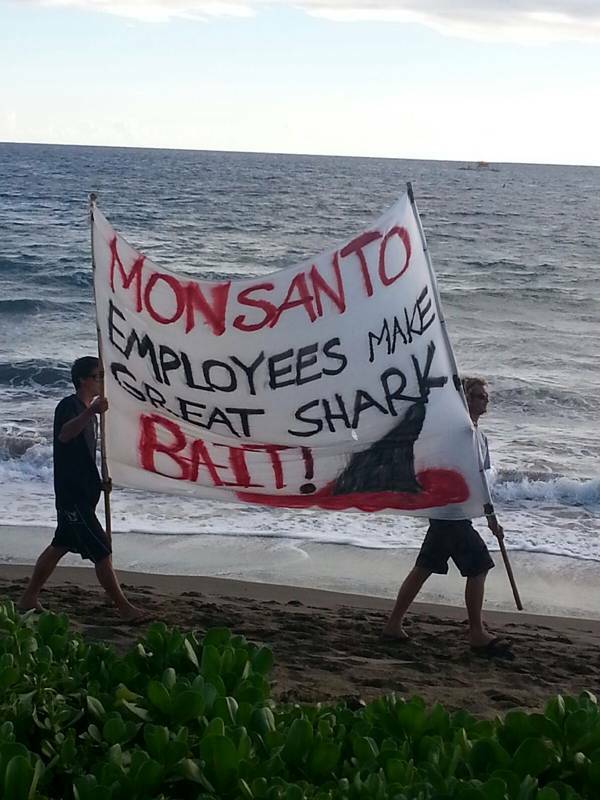 Here’s what they instigated at conference there in Kaanapali last year. I possibly could not have staged these at all because these were posted all on their social media pages. The best sign at that event had to be the one that they walked up and down the beach with. The message written on there just warms your heart and brings wonderful feelings of joy. It also appears to be drawn on with synthetic chemicals likely with a lot of fumes on a Monsanto derived cotton sheet too! Oh, yes, and if these people ever get a hold of your photo, just wait and see what they will do with it. 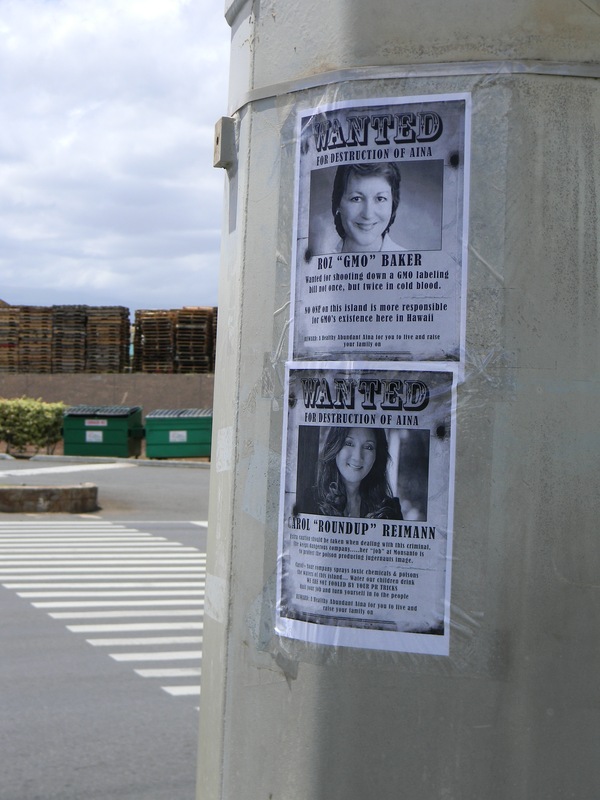 They will make wanted posters of you and put them on public property once again! 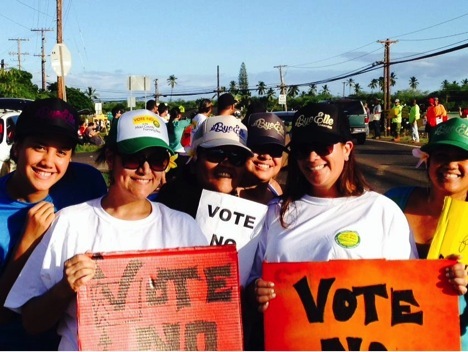 Can you feel the love, aloha, and feeling of cooperation and collaboration of these activists? I bet you can definitely feel that this is a group that is workable and reasonable. I bet the politicians that these people are supporting are just as lovely too and share the same values of these people of aloha. Of course, these folks want to “educate” the public and have their activists target farmers in the community or even involve themselves in county matters. As a kid, my folks taught me to not associate with people who would reflect badly upon oneself. Hanging around hoodlums made you one of them even if you didn’t participate in their antics. My friends were the nerd folks and boy were we picked on as kids. At least, I never got into trouble and developed a bad reputation as a person and we all kept each other up and up. Too bad that lesson doesn’t apply to us when we become adults. It really should because who would be proud to associate with these kind of people and their antics. It’s so no local style to be like this but I have to remind myself that there is a new local style emerging in our islands where it’s about me, myself, and I and what I eat and grow and I’m being poisoned but am still alive and healthy enough to protest, graffiti, and say nasties on the social media. 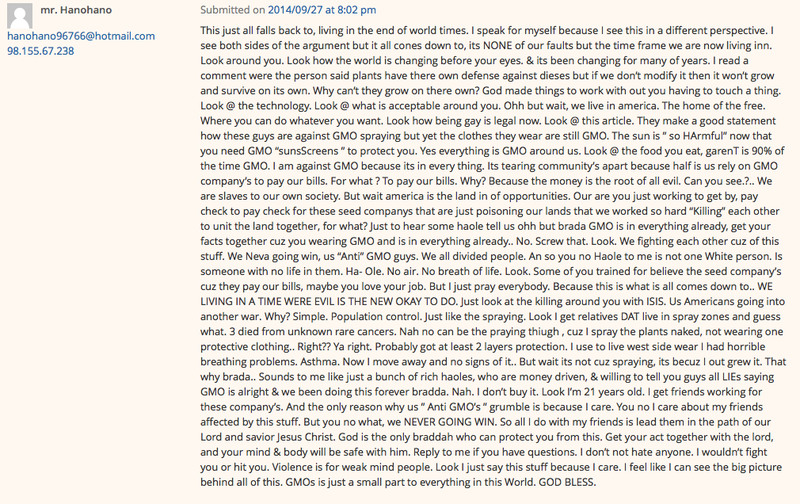 Oh, yes, and I’m not the only one who has seen the ugly side of the anti-GMO activists and speaking up about it. Even a Maui News blogger, Harry Eager, has experienced this kind of behaviors. 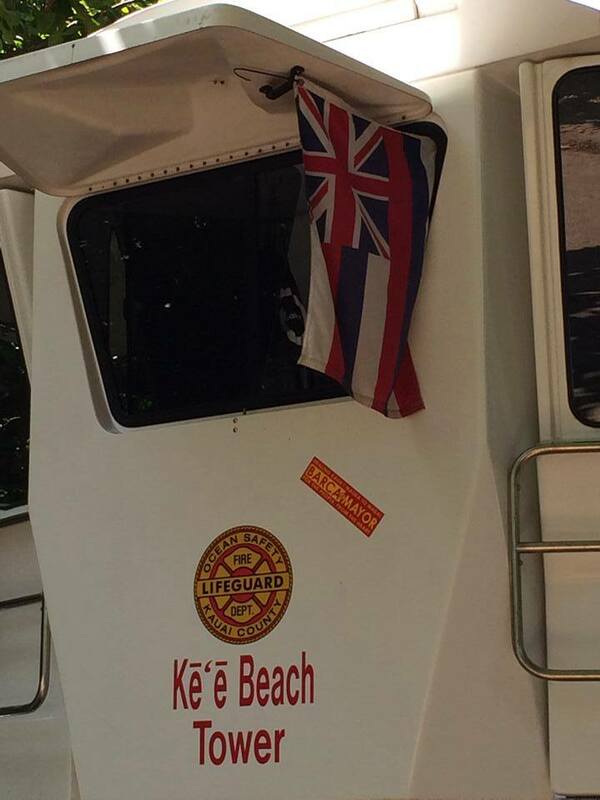 Are you going out to call him for his un-aloha spirit for pointing this out?! Take a good look at all of this and ask yourself, “Is this the Hawaii I want for the future? Is this what I want my kids to think is okay? Is this the kind of actions that should be tolerated in our communities? 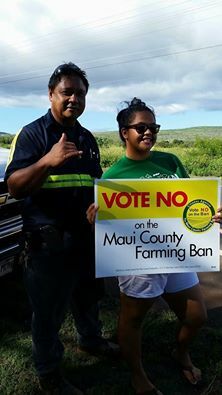 Is this the pono thing to do things in Hawaii?” If you can’t figure out the answer, then I know you don’t know how to respect the local values and culture we have here in Hawaii and you don’t share my roots in agriculture. What you’re doing is something that local folks would never do. The last 2 years have been very tumultuous here in our state in regards to biotechnology. Hawaii as a state has been the subject of the heavy hand of activism based in fear and misinformation and it hasn’t been pretty at all. Here’s a summary of what’s happening now across our state. 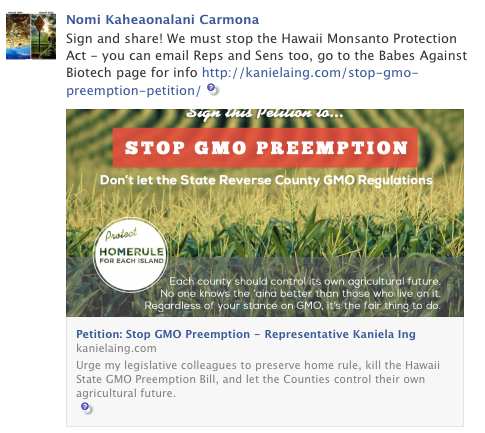 Last year, in the county of Kauai, the notorious anti-GMO bill was passed and invalidated in federal court. 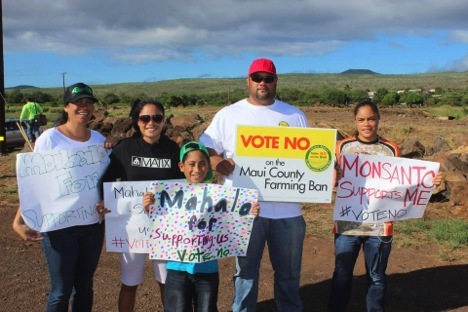 It did not stop the mainland based SHAKA Movement managed to garner some 9000 signatures to get an anti-GMO, anti-ag bill placed on the ballot. 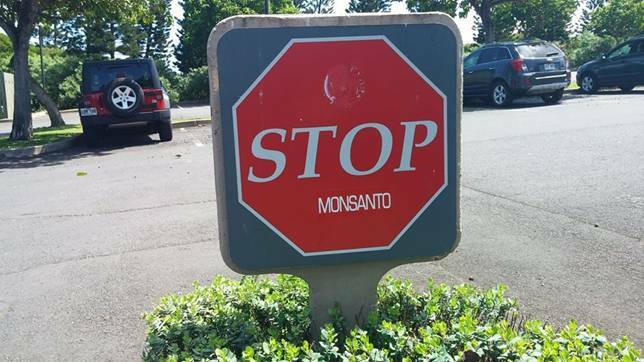 Despite many of the anti-GMO candidates losing in the primary election, groups like the Center for Food Safety are still working on stirring the pot in this county. Voters will get to decide on the issue on November 4th. This has activated the activists into some interesting behaviors in our the community there. There have been campaign signs vandalized and also stolen, which is not surprising at all. 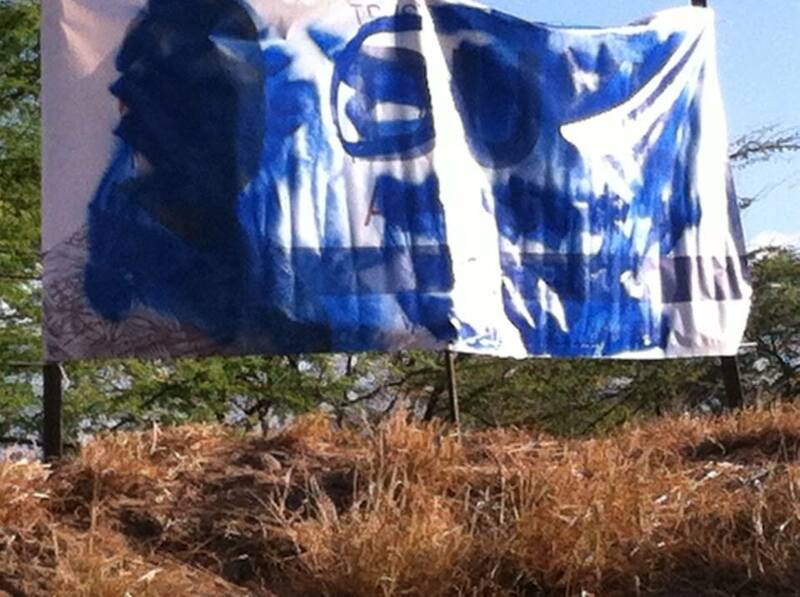 Gubernatorial candidate, Duke Aiona, had his sign spray painted on Molokai. 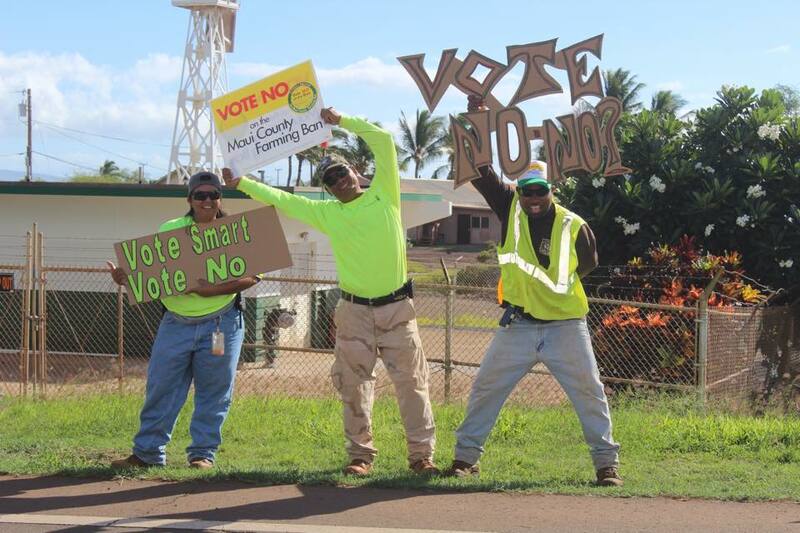 The ballot initiative signs on Molokai that asked voters to vote no were changed to “yes” votes. 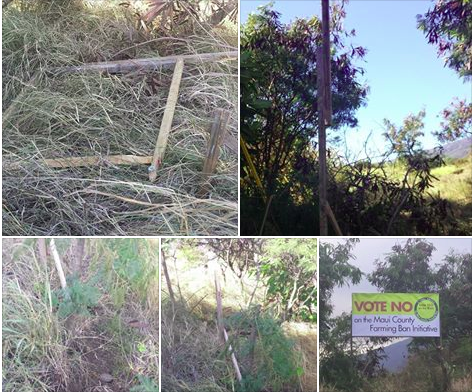 A vote no sign was taken and frame broken on private property of Christy Gusman. 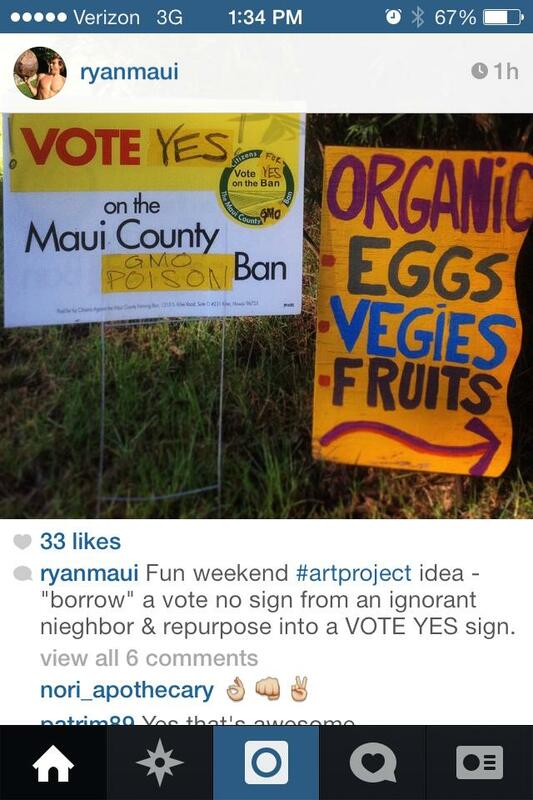 Proud vandals on Instagram boasting their activities of re-doing the vote no signs on Maui. 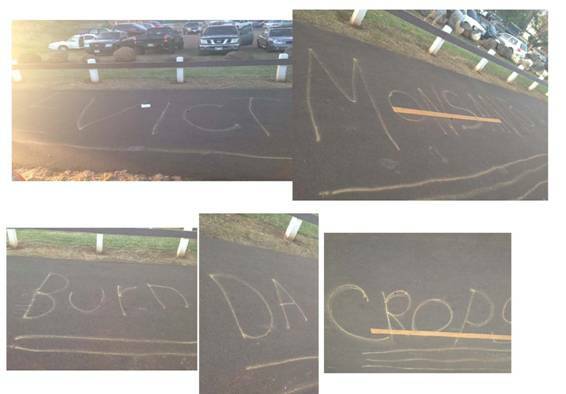 The activists have even resorted to defacing private property in the name of this movement. 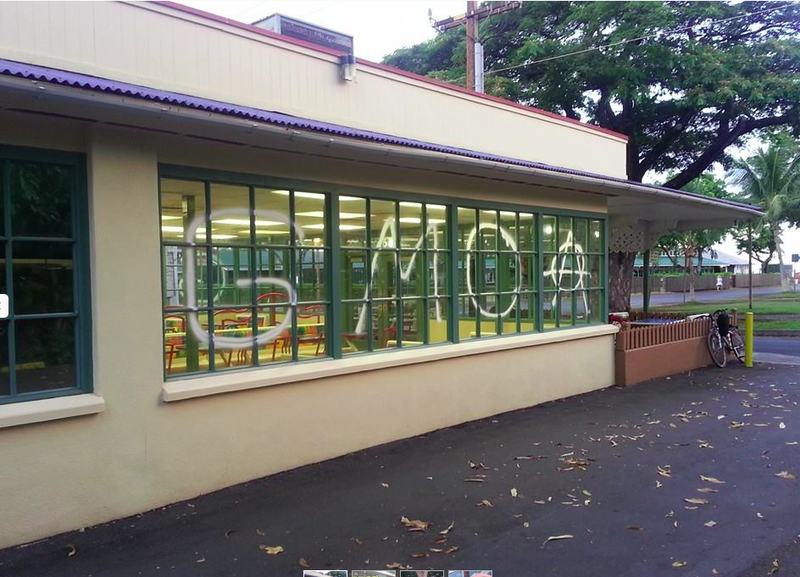 These are photos from the historic whaling town of Lahaina, where someone had some chemical fun with spray paints to get their message across. These people who claim to “malama the aina” or care for the land and be “pono,” or righteous, apparently forget these thoughts as they go about this campaign. The sad thing is that long time local folks, like this 90 year old senior citizen, are landing up cleaning up their messes. 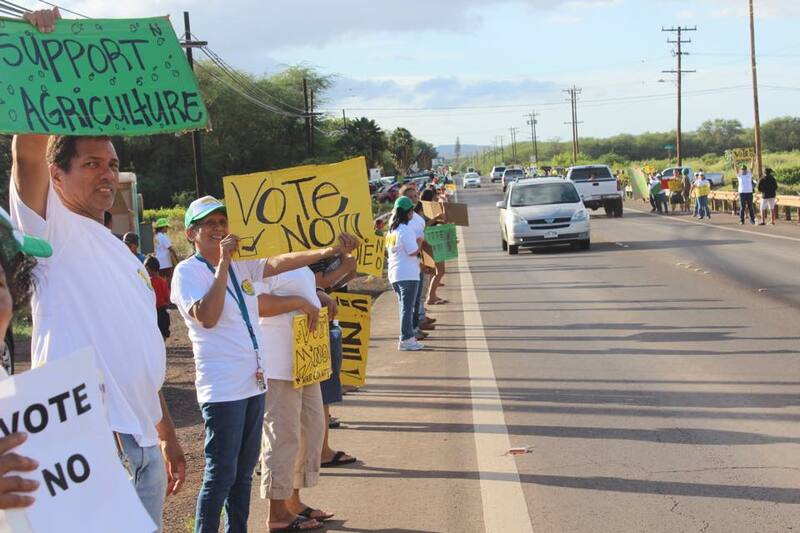 Not only was there graffiti and theft going on there on Maui, Molokai, and Lanai, but there was also reports of people being harassed by the activists at the County Fair by these people, who were shoving their brochures to vote yes on the ballot initiative. How do I know that? My mom experienced that at the fair herself and gave the activist a piece of her mind. 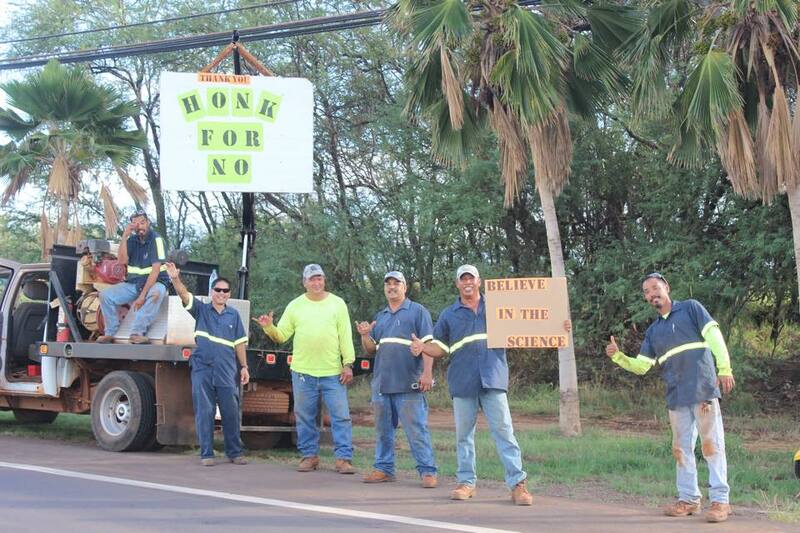 These SHAKA activists also took to photoshop to make posters of biotech employees also to help create the demons. Just look what they did to Dave Stoltzfus. 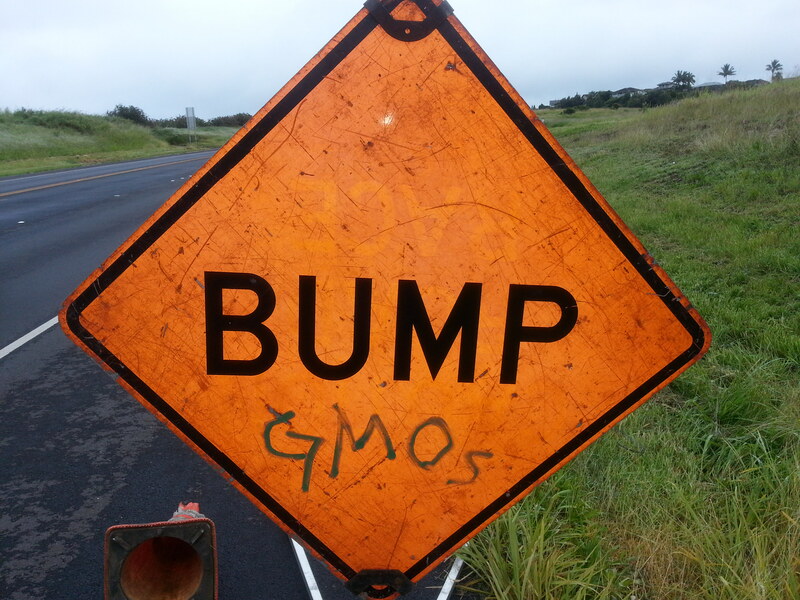 The missing part of this initiative in Maui County has been recognizing the economics of what a “temporary moratorium” to study the effects of GMOs there could do to those islands. A long time, well known economics expert, Paul Brewbaker, was recently hired by the Maui Chamber of Commerce to study the effects of this proposed initiative there. What he found was that it would be devastating to this county, which is no surprise. It will have a major impact there and would hurt many local families there. 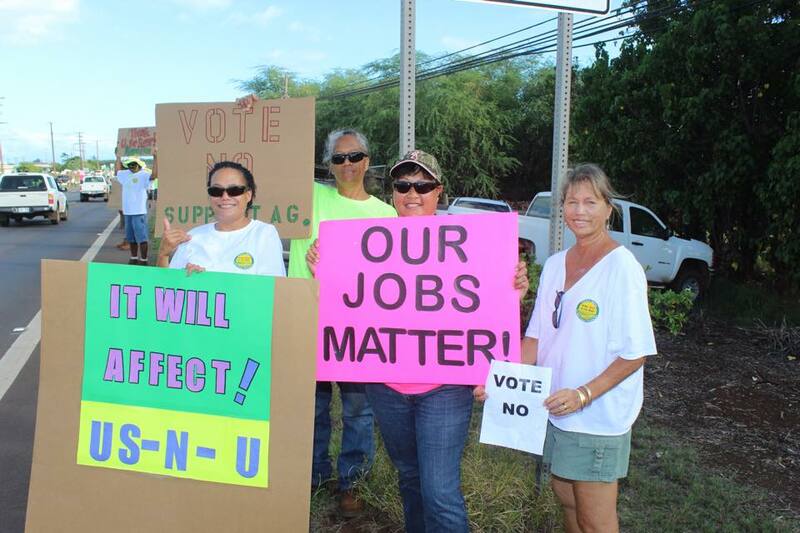 It’s estimated that unemployment may rise to some 25% on Molokai alone! The anti-GMO activists decided to send their biology bachelor of science degree, newly minted “economic expert” Senator Russell Ruderman to supposedly debunk Dr. Brewbaker’s study. Little does he disclose that he owns 4 natural health food stores on the Big Island and has no expertise in economics but he can “debunk” claims. 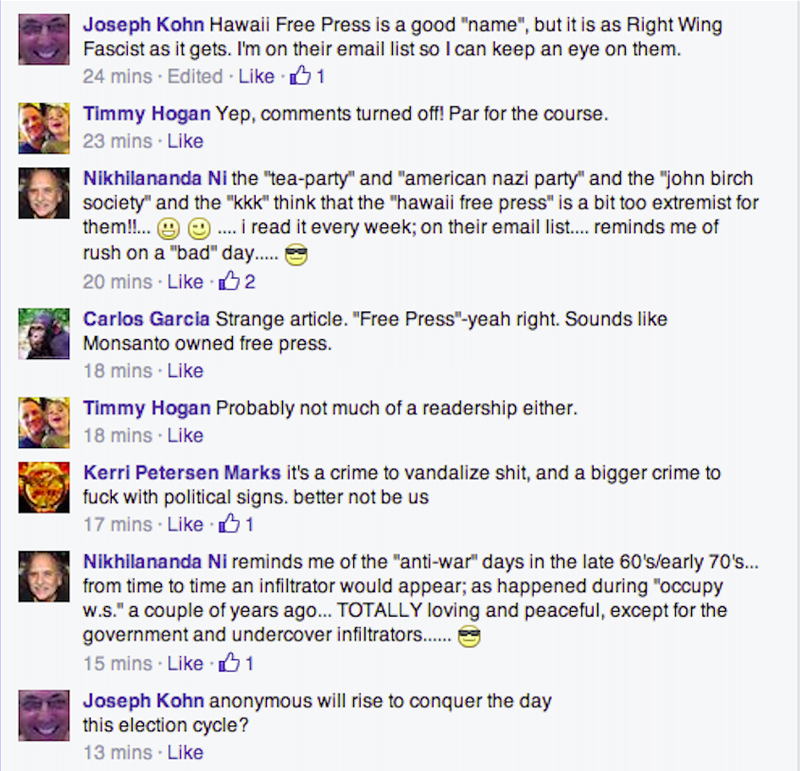 He’s the same state senator that published articles in the Big Island newspaper “educating” people on Bt. This man is always overstepping his scope of expertise, which is typical of many anti-GMO activists. Just take a listen to the claims he makes on the morning news. 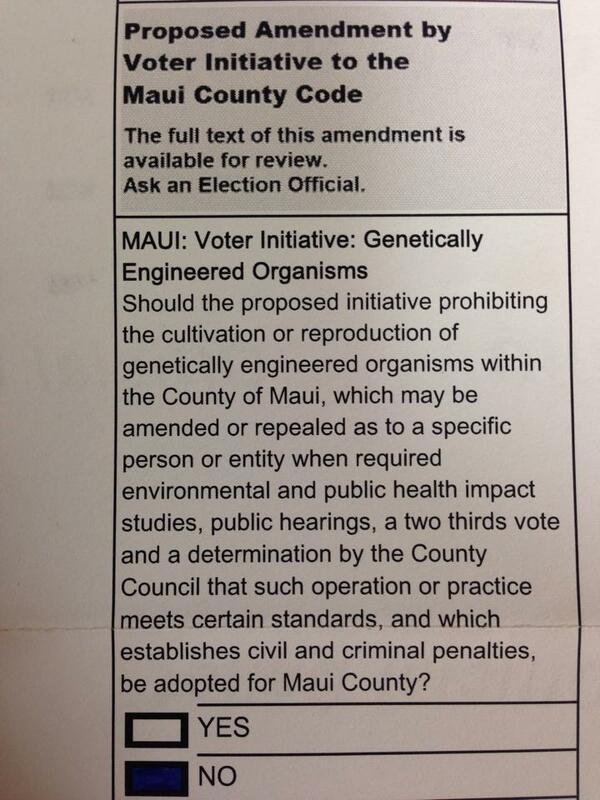 Maui County is definitely an ugly place at this moment with this heated debate between those versed in science and those who prefer to reject the evidence. 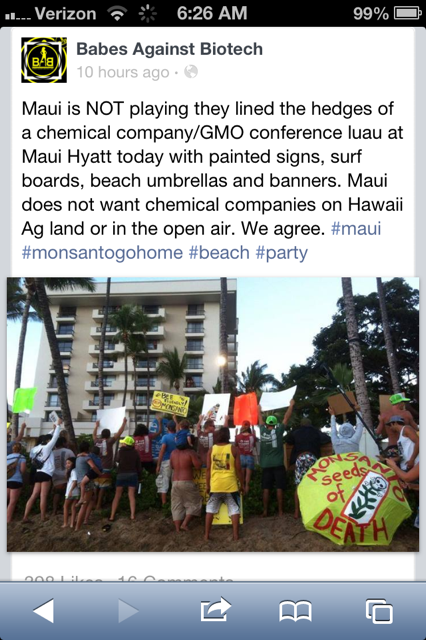 Kauai was definitely the poster child of a dysfunctional community last year with the entire anti-GMO movement centered there. With key county council members staunchly wanting to pass their flawed Bill 2491, irregardless to it’s validity, it set off a firestorm of discord. The Federal Court recently invalidated the law as expected and that didn’t end the vitriol. 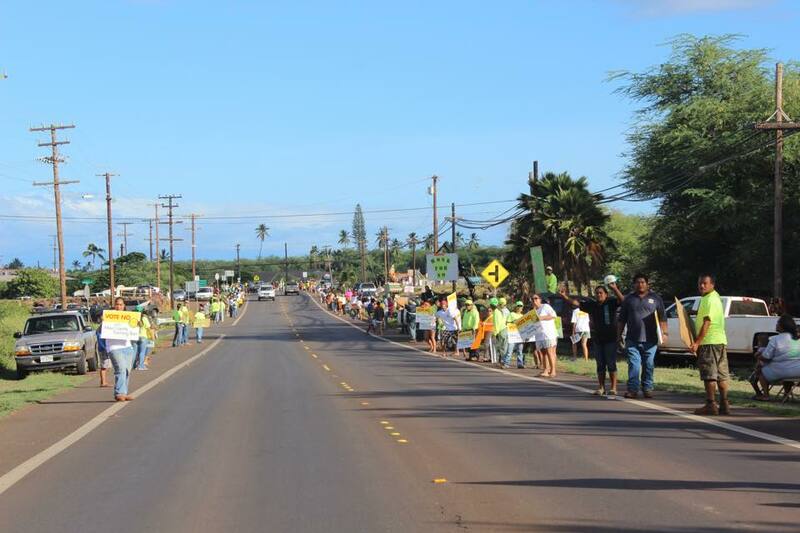 None of the studies or evidence collected (Final_Report_Kauai_Air__3_15_2013_submitted-2) to refute the claims being made were ever considered by the activists. The constant battle cry there is “stop the poisoning,” with the evidence showing no such support. 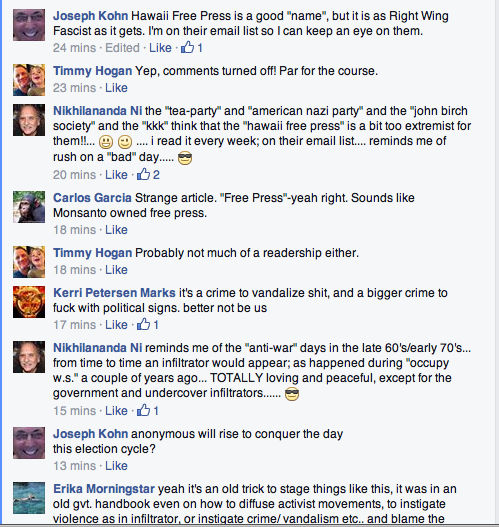 The story there is one of manipulation by the mainland funded Hawaii SEED and key leaders in the community. The county has decided to appeal the bill and continue to drain the funds to push this faulty law through. 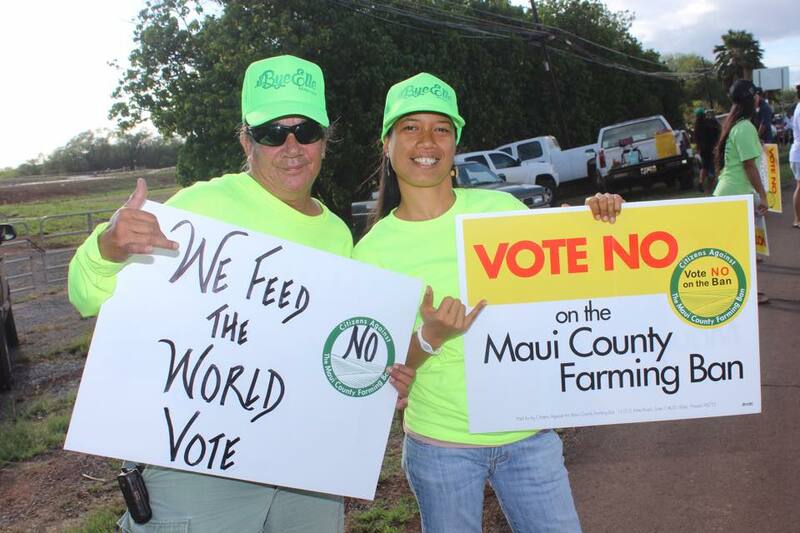 It’s of no surprise that in the primary election, the top vote getters were not the anti-GMO candidates, but the pro-ag supporters. They have been the subject of vandalism also, which is quite unfortunate but not surprising once again. 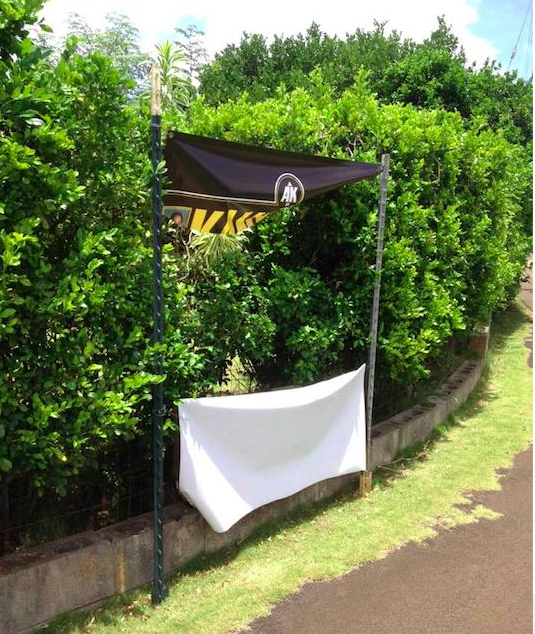 Kauai County Council Member candidate, Arryl Kaneshiro, had his banner slashed. 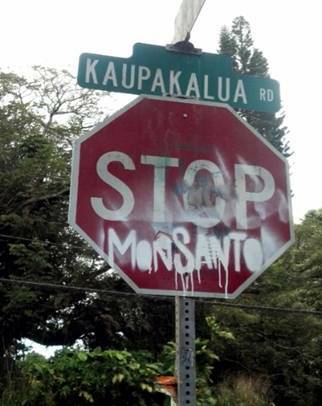 His family are long time farmers on Kauai and pro-agriculture, which made him a target of the anti-GMO activists. 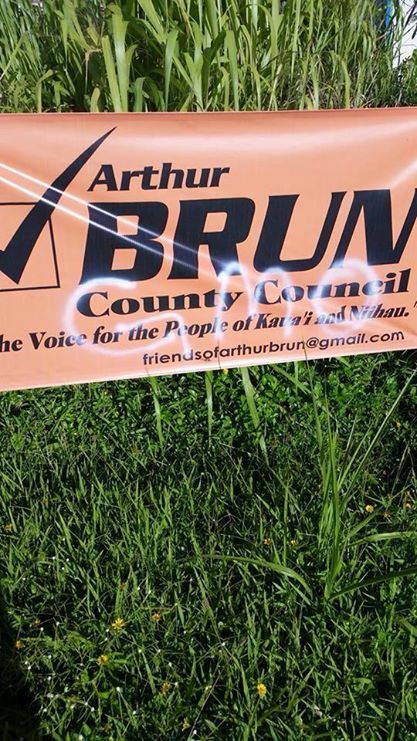 Another candidate for the county council, Arthur Brun, has his sign vandalized also. He is also an employee at a seed company, Syngenta. The vitriol has also spilled out into the community at public places also with the activists’ graffiti with their messages of “stop the poisoning.” Once again, they have fun with chemicals with no bounds and leave messes for everyone to see. 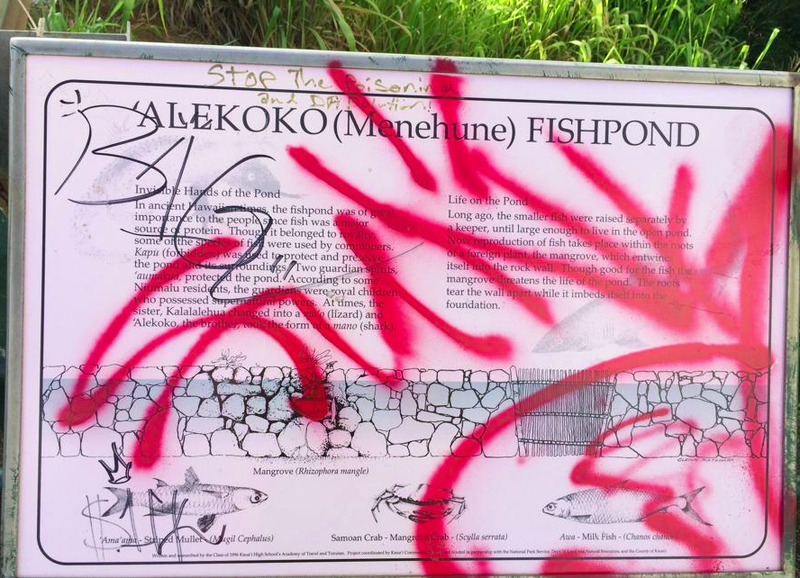 This is what tourists and other visitors get to see when they stop by the historic menehune fishpond. The MMA fighter mayoral candidate, Dustin Barca and his followers are demanding others follow their laws, but can’t even follow the laws in existence already. He has his election signs up on public utility poles and on county owned lifeguard shacks. Signs on utility poles are against the law for safety reasons but Dustin Barca’s crew have no regard for this law apparently. A bumper sticker is vandalism on public property but following the law means nothing to this mayoral candidate. Then there is Kauai County Council Member, Tim Bynum, showing his lack of emotional control and maturity at public meetings. He has tried to initiate more anti-ag laws here and seems to be losing it when others don’t seem to agree with this tactic. 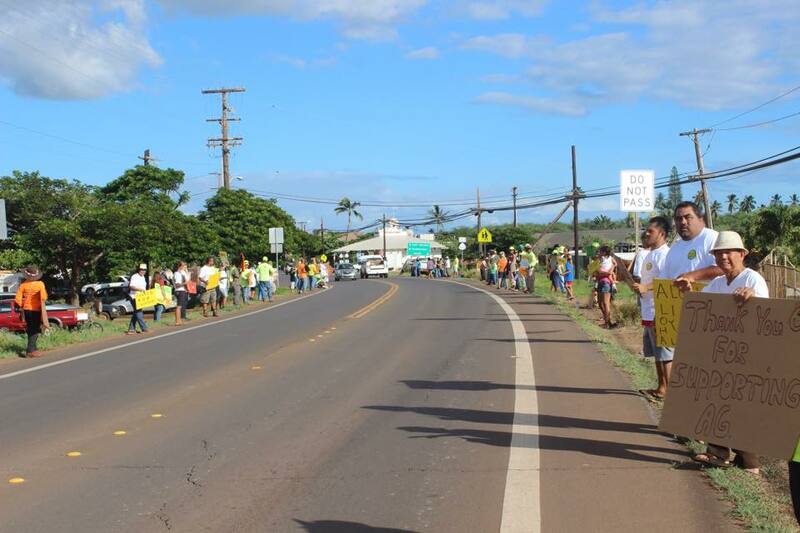 The damage to Kauai’s community is done and it’s clear that it isn’t going to be changing any time soon with these types of leaders in office. The community remains divided and the ugliness is still evident. 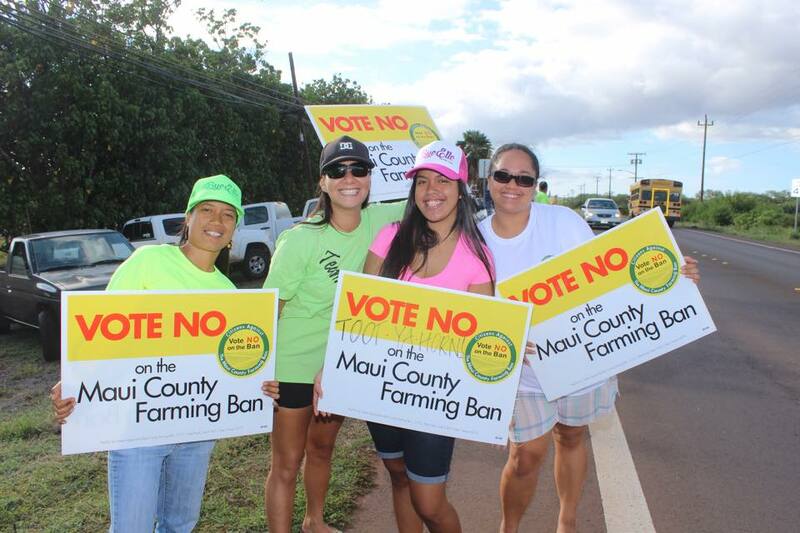 The latest fiasco with the anti-GMO movement ends with Oahu and the North Shore Neighborhood Board meeting last month. From what my dad and brother said from attending it, the meeting was dominated by the anti-GMO activists. The Center for Food Safety’s director was also there, Ashley Lukens, to stir the pot even further with her lofty agenda. The activists were dictating to the community how they wanted farmers to farm despite not being farmers themselves. The only 2 farmers were brave enough to speak up against vitriol that the resolution was withdrawn. At yet another meeting, a week after the regular board meeting, the North Shore Neighborhood Board Ag committee met to amend the resolution that was discussed prior based on the testimony received. There were about 30-40 activists there who were very rude and hostile and accused the chair of being “a Monsanto lobbyist and having a conflict of interest because she worked for the Chamber of Commerce.” The Chamber receives membership dues and donations from Monsanto as they from 225 other members. The NS Chamber is a 501 c3 and cannot lobby which was clearly explained to everyone in attendance there. A committee member made a motion to kill the resolution and eventually it was seconded and passed, unfortunately. The baby was thrown out with the bathwater. 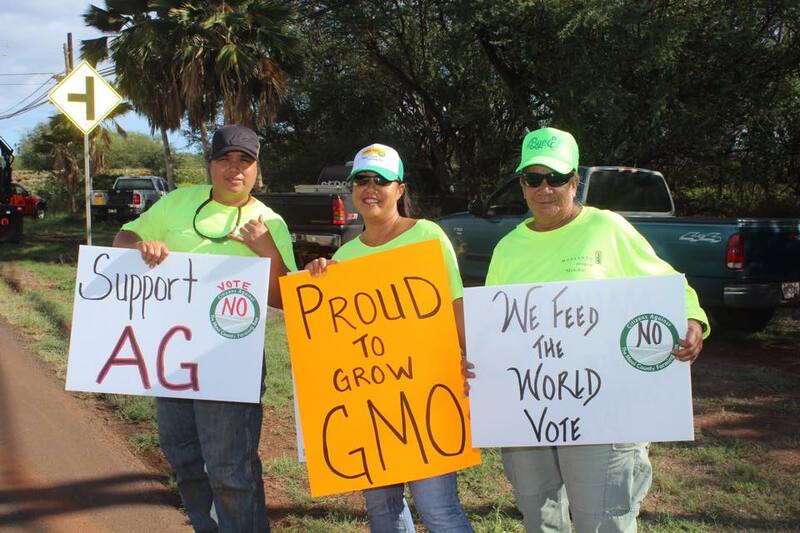 Even an anti-GMO supporter felt that their supporters were rude. 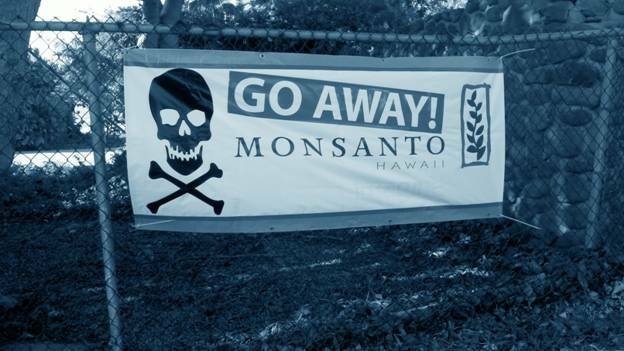 Also at the Haleiwa Town Christmas Parade the last two years, which the Chamber sponsors/organizes, they have dressed up in hazmat suits and inserted themselves into the parade between Monsanto’s monster tractor and a cub scout troop probably scaring the kids. 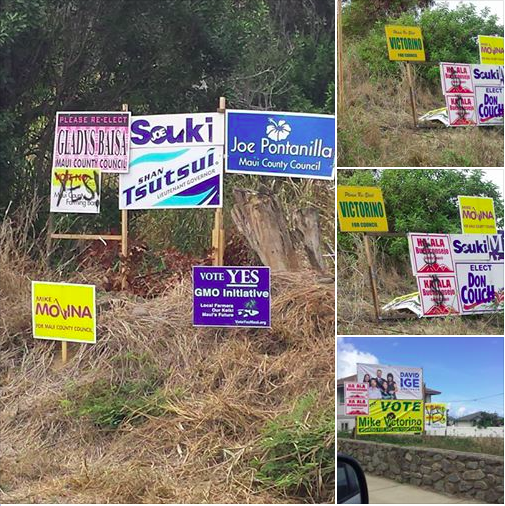 Candidate signs have also been reported stolen and it isn’t a surprise that the person who is losing them is a pro-ag supporter. Kent Fonoimoana, who is running for the House of Representatives in District 47, banned me from his campaign page for questioning his support of the GMO label and pointing out his alliances with the Sierra Club and Earthjustice. He even requested a tour of my dad’s farm only to later that that he’d support farmers but still wanted a state law to label GMOs. This guy is so disingenuous that I’m not surprised that his allies, the anti-GMO activists, have decided to steal signs from people’s yards. If they have done it elsewhere, it’s pretty likely the same bunch of people. As the court hearing for the anti-GMO Bill 113 is awaiting its judgment, the same pattern of ugliness is occurring there also. 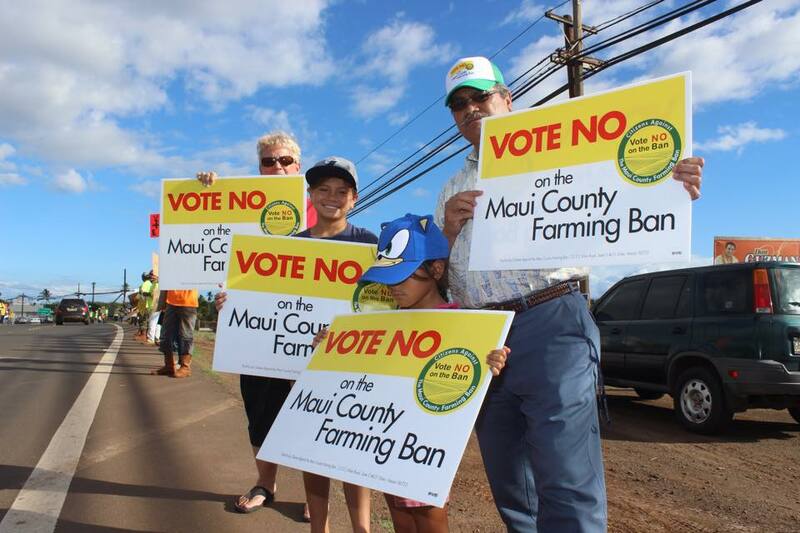 The contentious race is with the Monsanto obsessed Big Island county council member, Margaret Wille, against a newcomer, Ron Gonsalves. He too has had signs go missing and recently had a sign damaged. It’s all to clear that this is the work of the same activists over and over again across our islands. 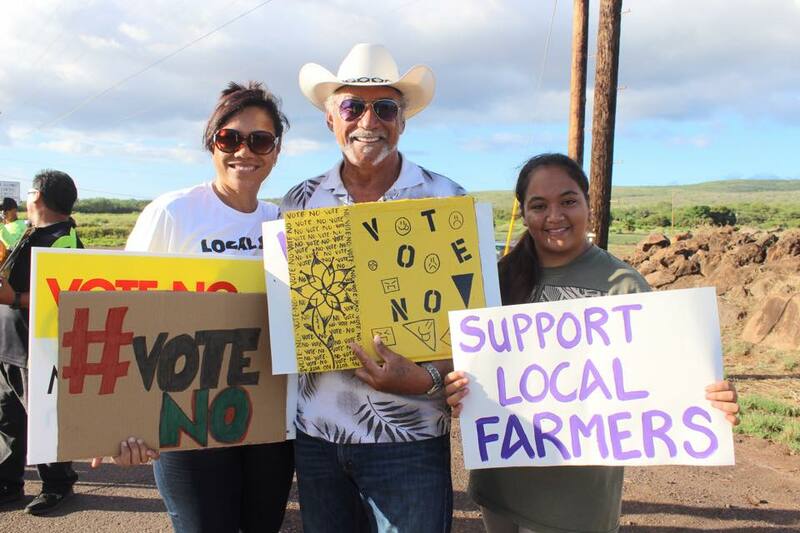 Even with the devastation of Hurricane Iselle, the activists didn’t give up their anti-aloha behaviors either and disrupted rallies that were there to provide information to farmers. They were not there to help these farmers, rather there to harass them instead. Our state was known as the Aloha state and I’m really starting to wonder if that is what we really are becoming. From the looks of our communities, it looks as if there is a new brand of aloha being cultivated here and personally, I don’t like it at all. We will never move forward if only attacks in fear are perpetuated in our communities. I hope voters make it loud and clear to these “leaders” that this is not our future. Just when you thought that the misinformation campaign couldn’t get any better, it got pretty good again. Not only have they bombarded the social media to indoctrinate their followers to their mantras but they have got it all compacted in a whole minute! Just listen here or read it below. The funniest thing about the whole Shaka Movement is that even some of their followers can’t even quite explain the law that they are proposing itself and don’t even know the content of it. Not only do these people not like being questioned for their movement, but some will even try to show you a baseball bat for questioning them. 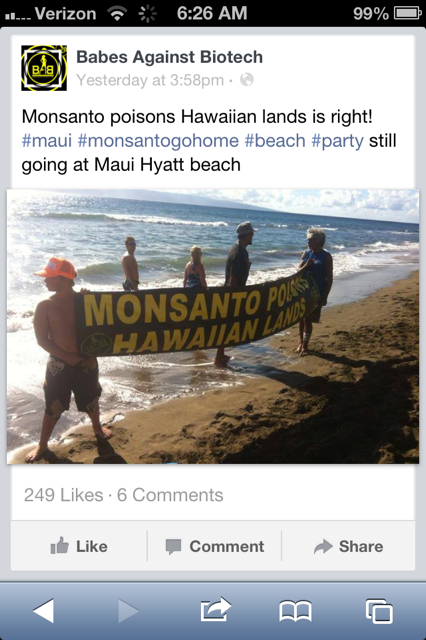 Not only do these people have so much aloha, but they will even beautify public property in the name of being allegedly poisoned. Forget the fact that they exposed themselves to synthetic chemicals and aerosols and some solvents that are known carcinogens. They likely did this without a space suit too! Oh, yes, and these malama the aina pono preachers (aka “I love the land and do what’s right but don’t quite know right from wrong) has no boundaries when it comes to private property either. They come with the mentality that what’s yours is mine apparently. It’s funny that these same folks have all kinds of weird spellings and conspiracy theories about the whole biotech issue and when you point out the obvious, they are the first one to call you ignorant. Sure, your internet knowledge and Google searches have made you a whole lot smarter than any farmer. In this aspect, I make like an anti-GMO activist and don’t read the flood of “intelligent and thought provoking” comments. It gives me inspiration. NOT. Well, I can’t enlighten everyone about the wonders of biotechnology unfortunately. Especially if people would rather socialize, I mean protest, something they clearly don’t understand but think they do. So yes, keep sending those comments, and denying the facts and evidence. Facts and evidence don’t need mantras and emotional terms of people and the aina dying or being killed because it just doesn’t stand beyond a reasonable doubt. 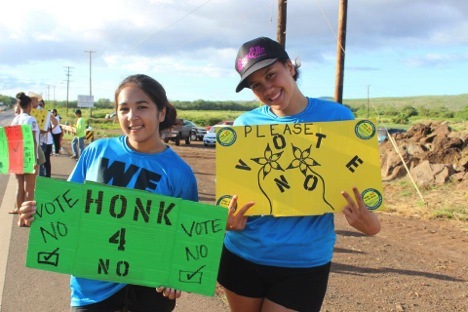 And please, don’t send me any comments about how you’re now going to save the turtles, protest the Mauna Kea telescope, surf by a Superferry, and hijack the North Shore Neighborhood board meeting with an anti-farmer crowd. I would love to hear how you’re going to participate in a civil discussion about how agriculture will move forward first and foremost sans any mention of Monsanto.